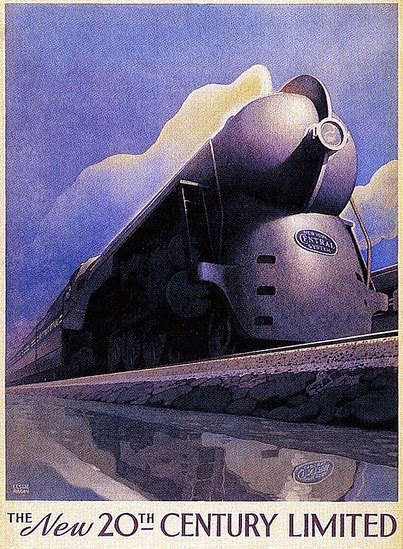 I came across this image a couple months ago, and held onto it, thinking I'd go down to where this used to be. 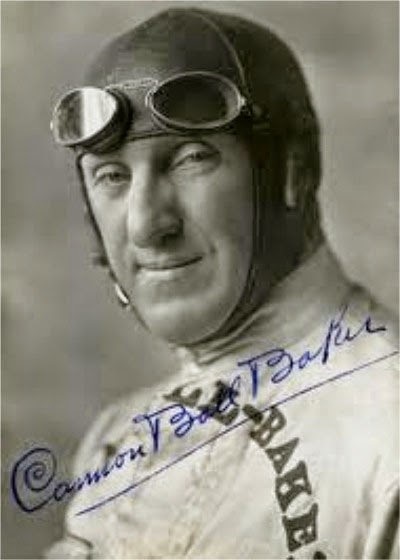 Cannonball Baker rode a Neracar from Staten Island, New York, to Los Angeles, California, in the autumn of 1922. The journey of 3,364.4 miles took 174 hours and one minute to complete. 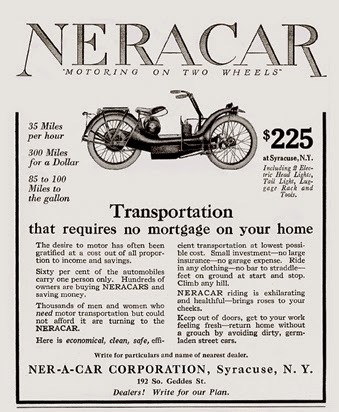 The advertizers publicized the Ner-A-Car's step-through design and its protection from road grime and engine fluids, both of which allowed riders to wear ordinary clothes, including skirts, cassocks, and kilts, while riding the cycle. 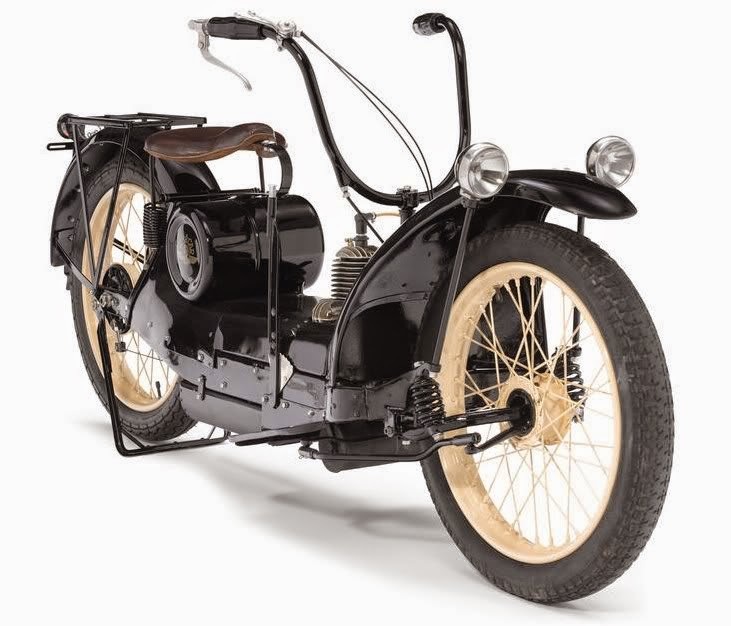 It was unique for its hub-center steering and widely acclaimed for its stability from it's low center of gravity. 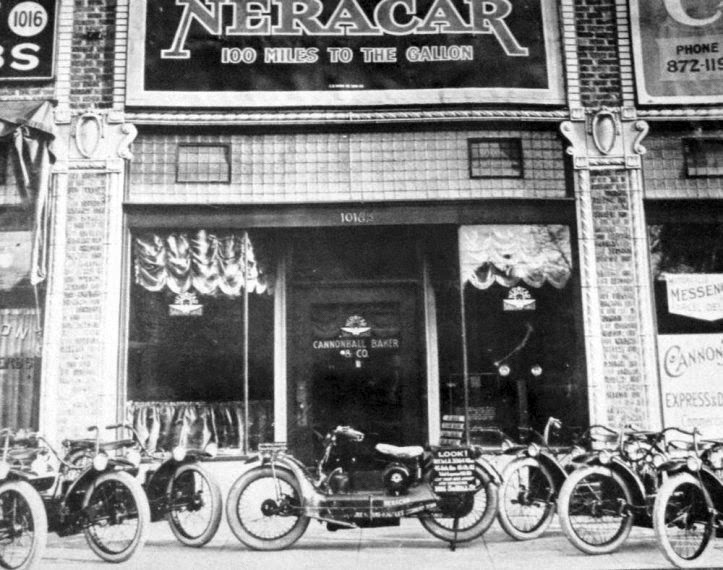 In October of 1922, Erwin "Cannonball" Baker set out from Staten Island, NY, on a cross-country run to Los Angeles riding a stock 1923 Neracar motorbike. 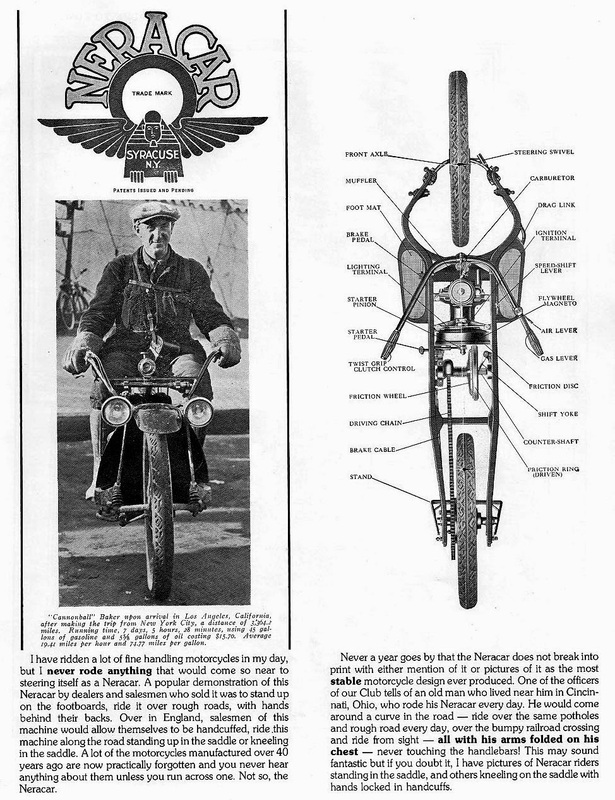 The only modification he made to it was the addition of a crossbar on the handlebars to stiffen them for what he knew would be "the rough stuff" that lay ahead on his journey to see for himself and prove to others just how reliable and economical this scooter-type motorcycle could be and appeal to the masses in the process. 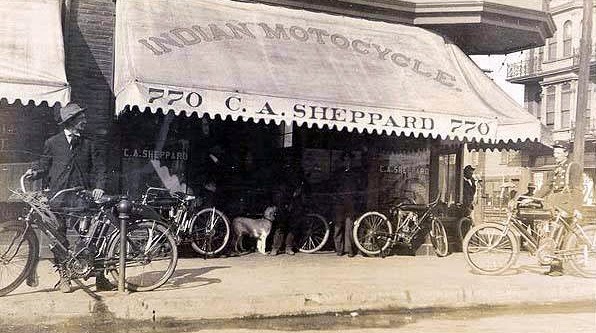 There were never any doubts on his part as to whether or not he'd reach Los Angeles. In fact, he was dead sure he would make it. 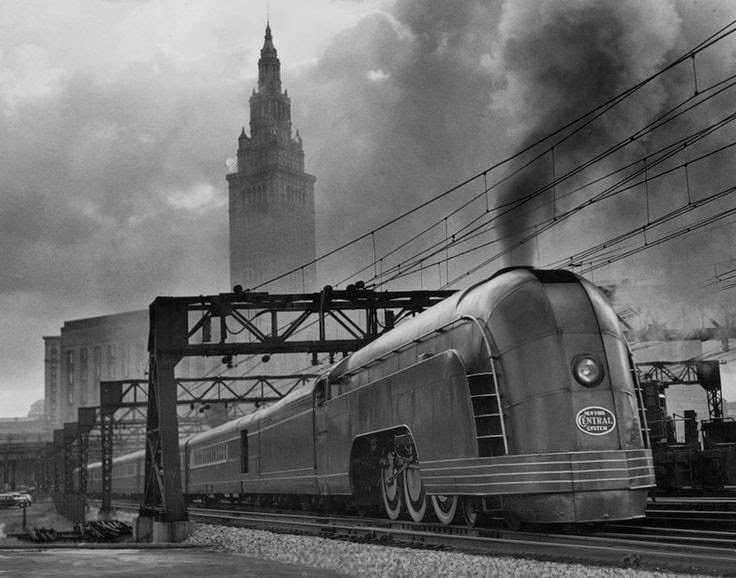 What he wanted to know was just how cheaply it could be done... operating costs totalled $15.70 at the time. It took 48 gallons of gas. 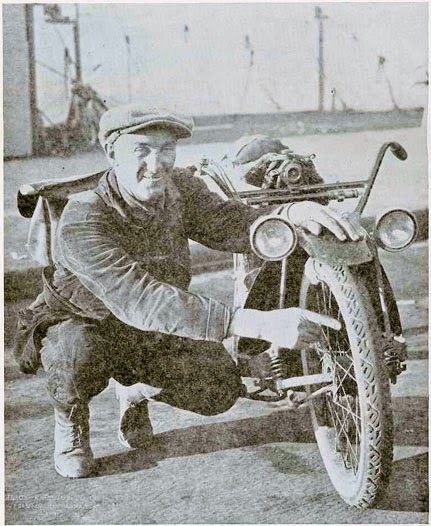 "The machine I used was picked off the floor from stock, and nothing special was put on it except a cross-bar on the handlebars to stiffen them for the rough stuff that I knew I would be up against. 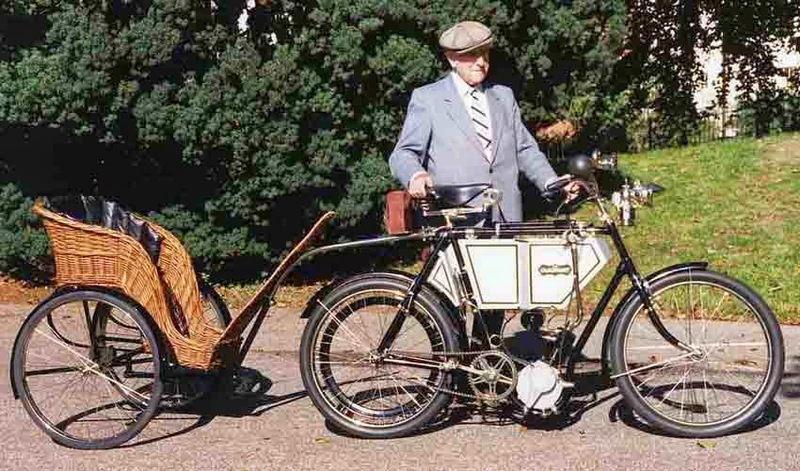 The machine was fitted with a Corbin-Brown speedometer and was only run enough to make sure that everything was OK, When I started my speedometer registered just 29 miles." 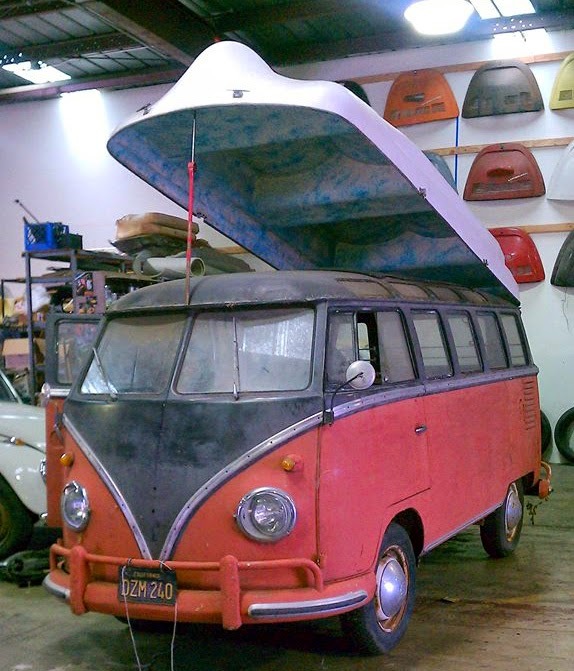 very cool... why didn't this sell more boat toppers? 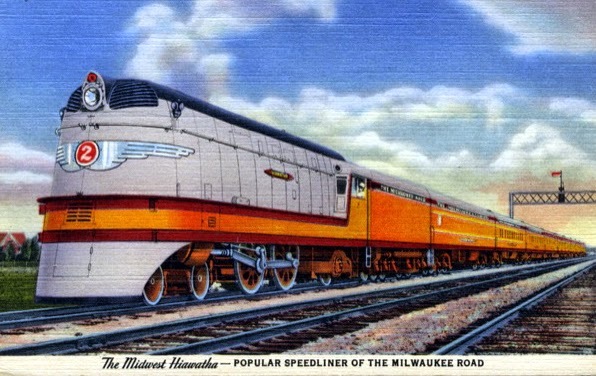 Streamlining the old steam locomotives was done for several reasons, as backups for the diesels that weren't trusted as much as the steam engines, and because it was cheaper to facelift old engines than by new diesels, and they felt the streamlined engines would be good for 2-10 % more weight load. The fact that they are beautiful helps too. 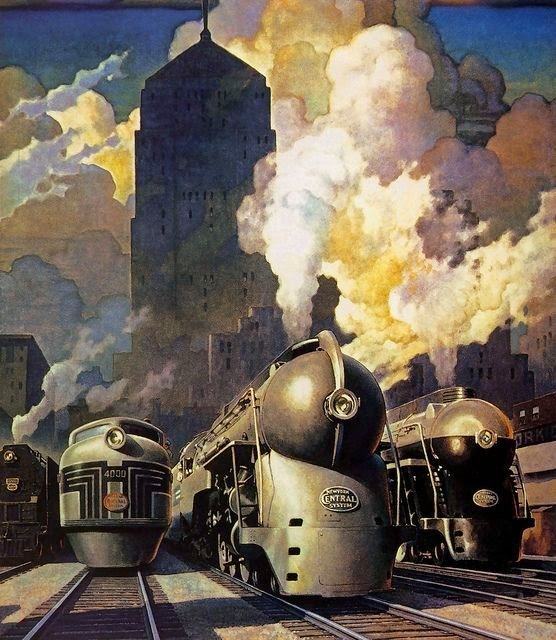 In 1934 the New York Central went with the expertise of industrial designer Henry Dreyfuss, who had only worked in design since 1929. 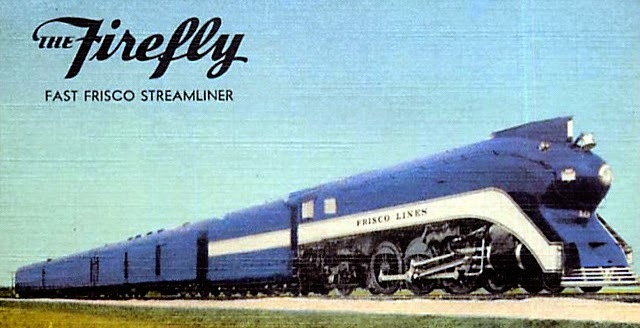 Dreyfuss designed the streamlined, Hudson-type steam locomotives built by Alco for New York Central's famous 20th Century Limited passenger trains as well as airplanes and buses. You might also be a fan of his designs that became the Princess™ phone, the Perisphere at the 1939-40 New York World's Fair and the Strategy Rooms at the Pentagon. 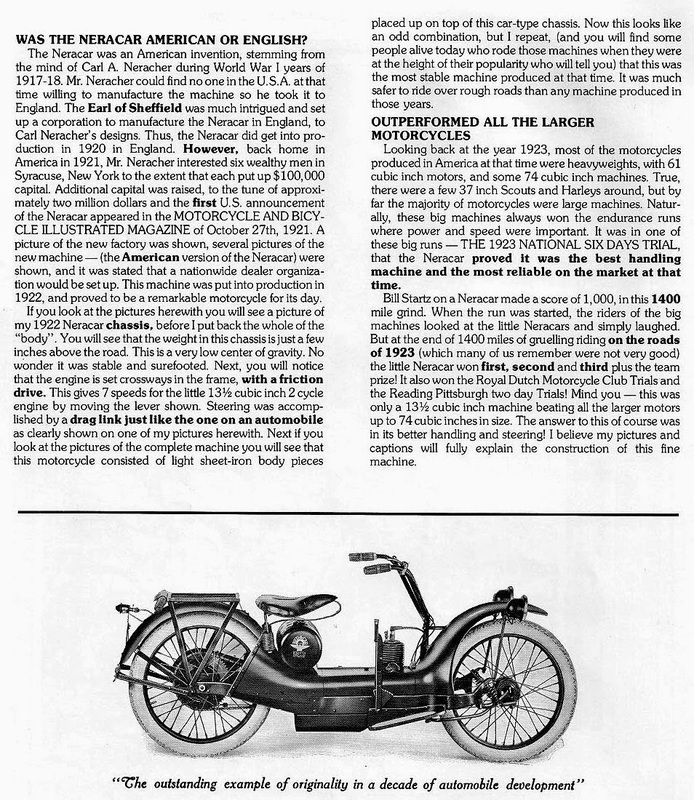 However, Dreyfuss is best known among 2-cylinder enthusiasts for his design of the 1939 Model A and B John Deere tractors. 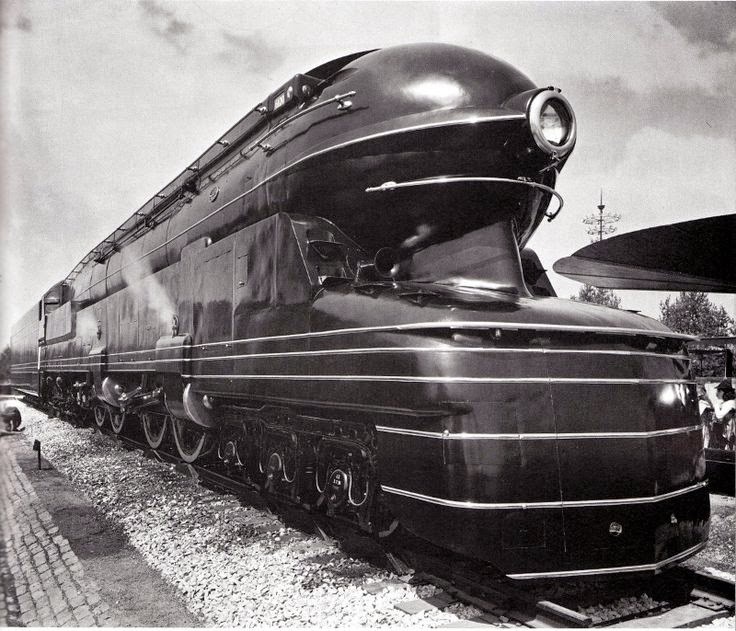 above, the streamlined Art Deco styled shell of the locomotive was designed by Raymond Loewy. 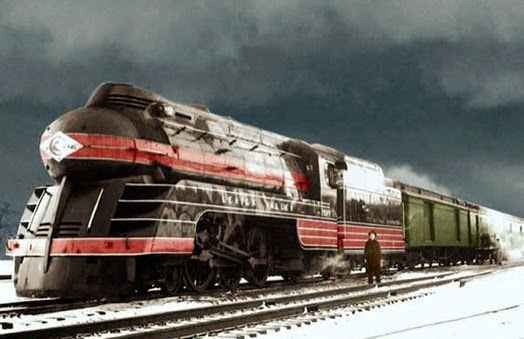 In 1937, Pennsylvania Railroad officials decided to build a new passenger locomotive to replace its aging K4s locomotive. 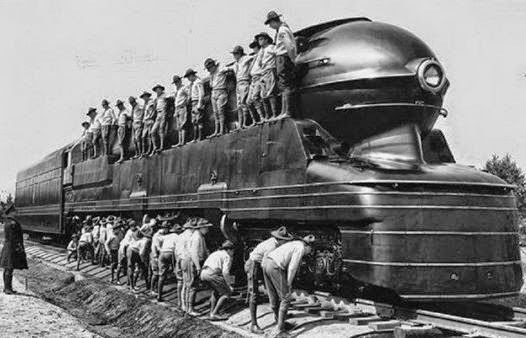 The PRR S1 experimental steam locomotive (nicknamed "The Big Engine") was the largest rigid frame passenger locomotive ever built. 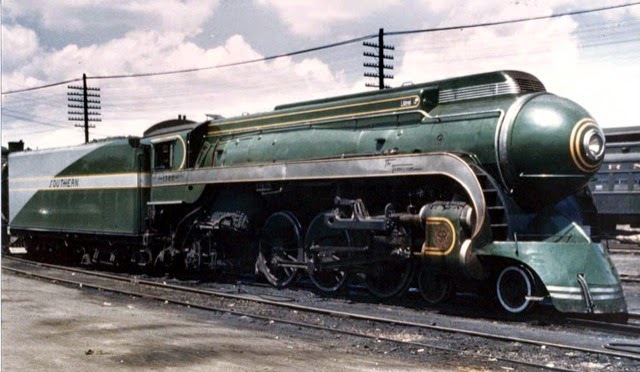 The S1 was the only locomotive ever built to use a 6-4-4-6 wheel arrangement. 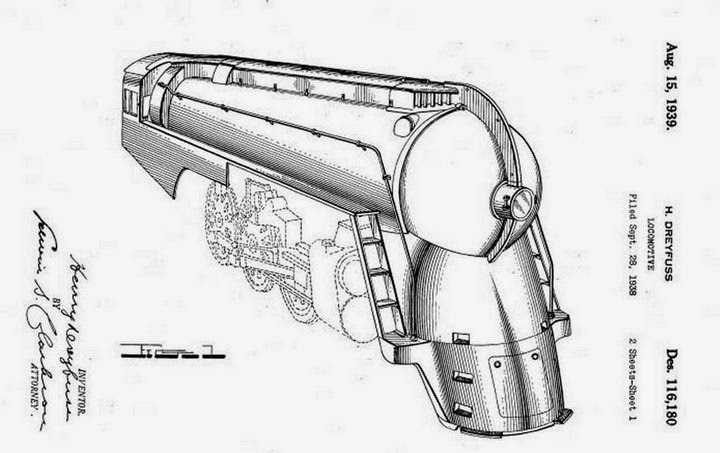 Also, the S1 class was a duplex locomotive, meaning that it had two pairs of cylinders, each driving two pairs of driving wheels. 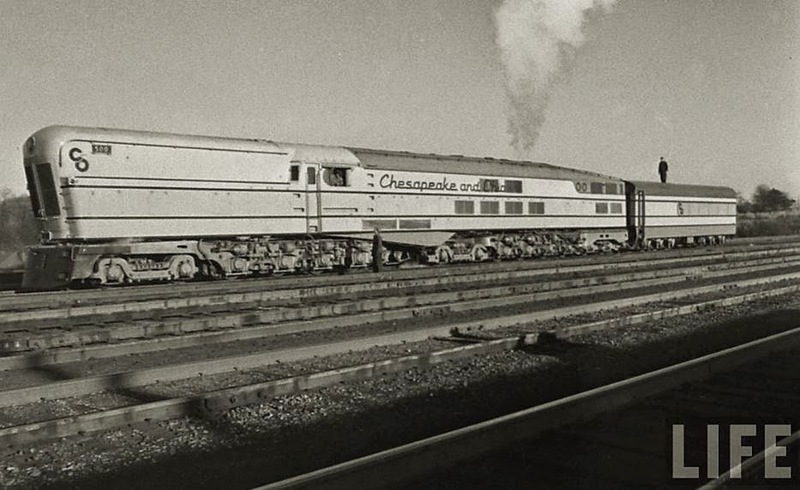 Unlike similar-looking articulated locomotive designs, the driven wheelbase of the S1 was rigid. 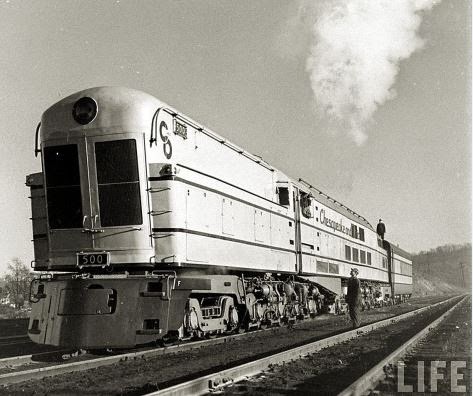 Crews liked the S1, partly because of its very smooth ride. 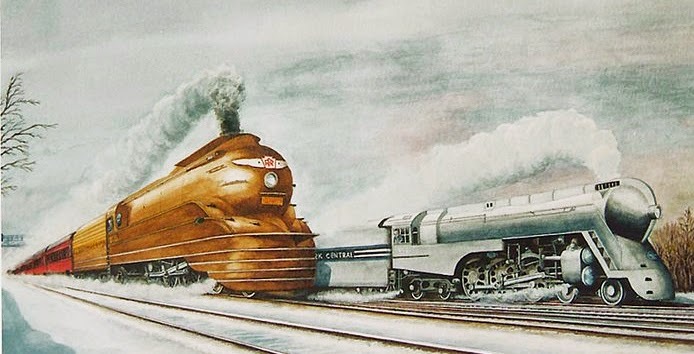 The great mass and inertia of the locomotive soaked up the bumps and the surging often experienced with duplex locomotives. 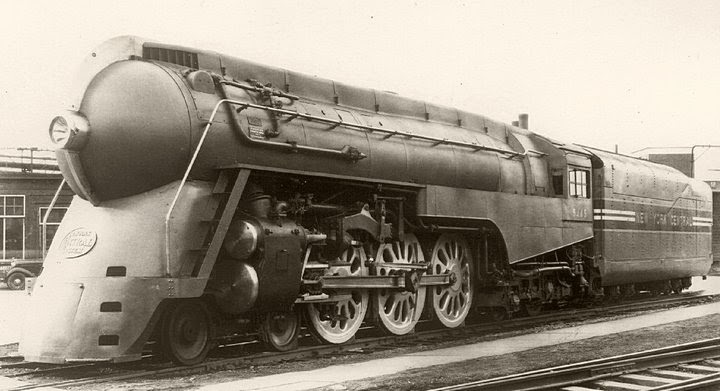 6100 was taken out of service in 1944 (after only four years of service) and scrapped in 1949. 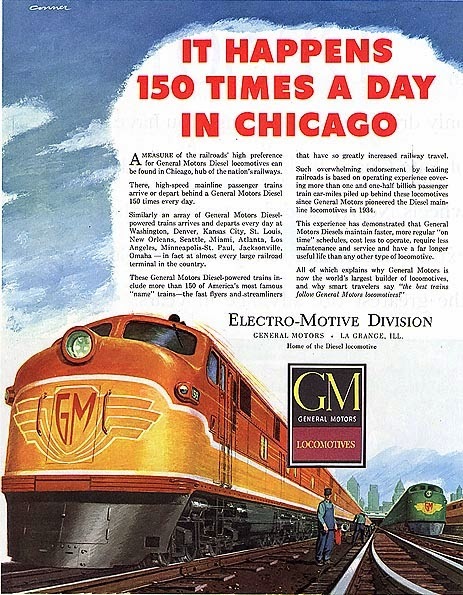 To really appreciate how long this locomotive was, you must first have a frame of reference. Consider the Big Boy. 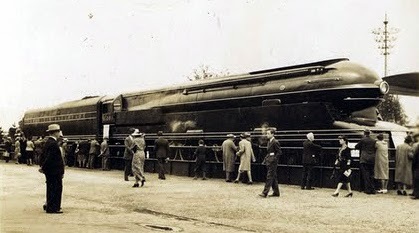 The Big Boy was generally considered to be the "largest" steam locomotive ever. It was over 132 feet long. 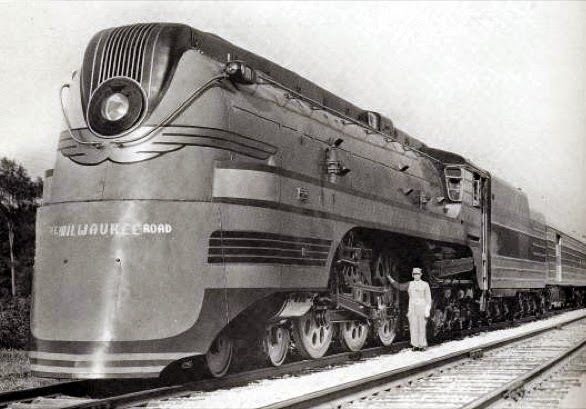 Unlike the Big Boy, the S-1 was not an articulated locomotive, yet, it was a whopping 140 feet long! 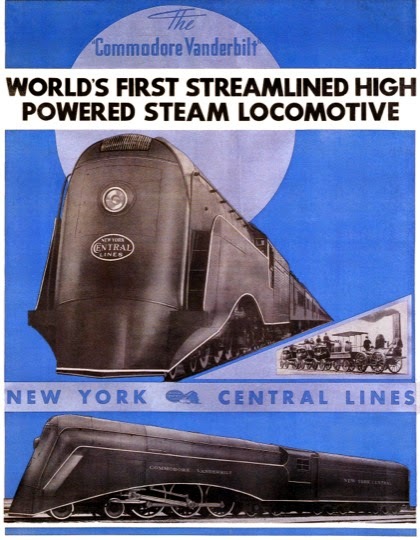 The S1 was displayed at the New York World's Fair of 1939, to reach the World's Fair, the S1 took a circuitous route over the Long Island Rail Road. 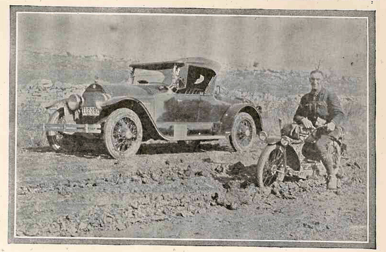 Many obstacles had to be temporarily removed and other obstacles were passed at a slow crawl to reach the fairgrounds. 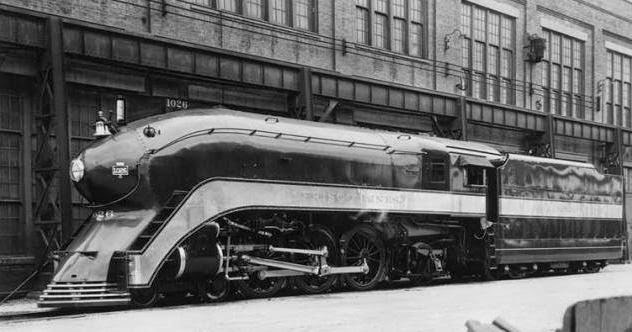 At the World's Fair the S1 was a dynamic display; the drive wheels operated under the locomotive's own steam power. 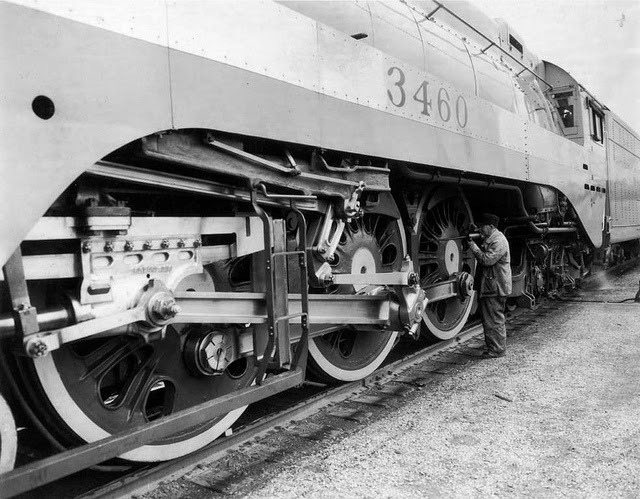 This was done by placing the S1 on a platform that had rollers under the drive wheels. 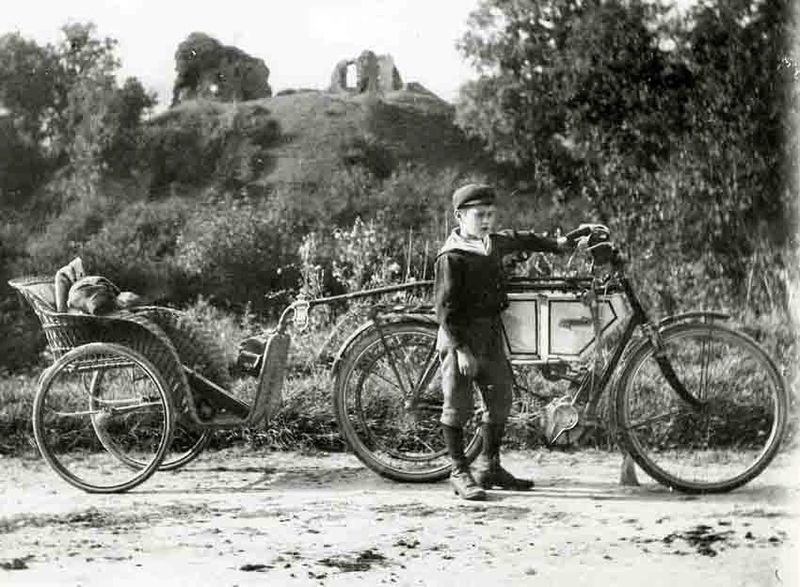 By using this type of display, visitors could see the duplex drive in use. 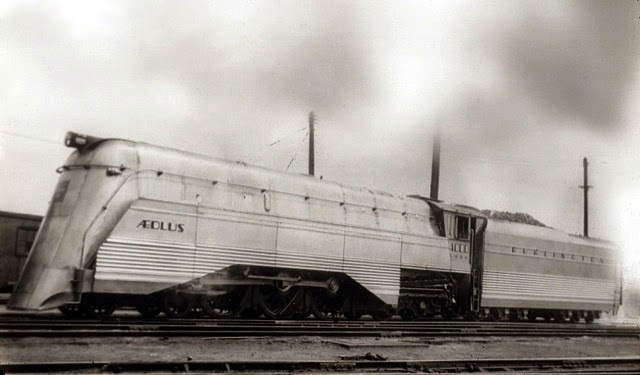 In 1941, Otto Kuhler streamlined a 1923 Alco Pacific locomotive for the Southern Railway for use on its Tennessean train, which (in conjunction with the Pennsylvania and Norfolk & Western) connected New York with Memphis. 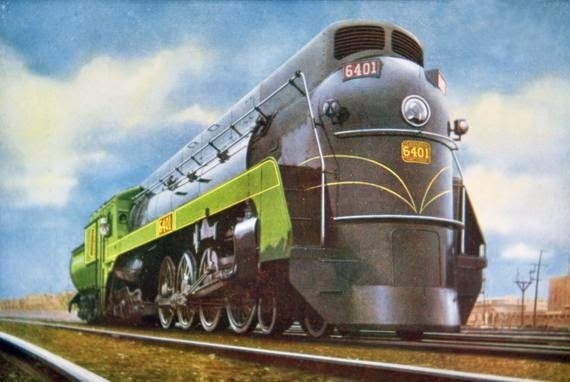 One of the Southern Railway’s bright green Pacific locomotives is displayed in the Smithsonian Museum, and the Tennessean locomotive combines this color scheme with the bullet-style of the B&O Royal Blue. 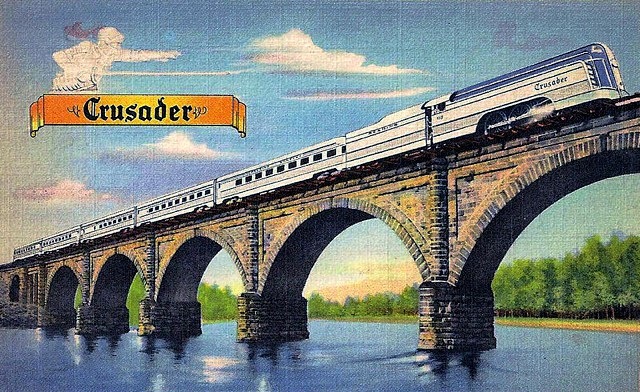 The Crusader covered the ninety miles between Jersey City and Philadelphia in a flat 90 minutes for an average speed of 60-mph. 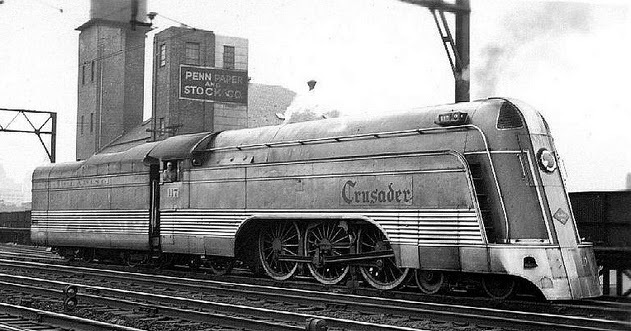 Because the Crusader was double ended it did not require turning at terminals. 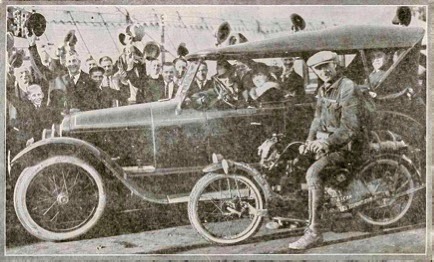 The Reading simply turned the power and reversed the seats in the cars for the return trip to Philadelphia. 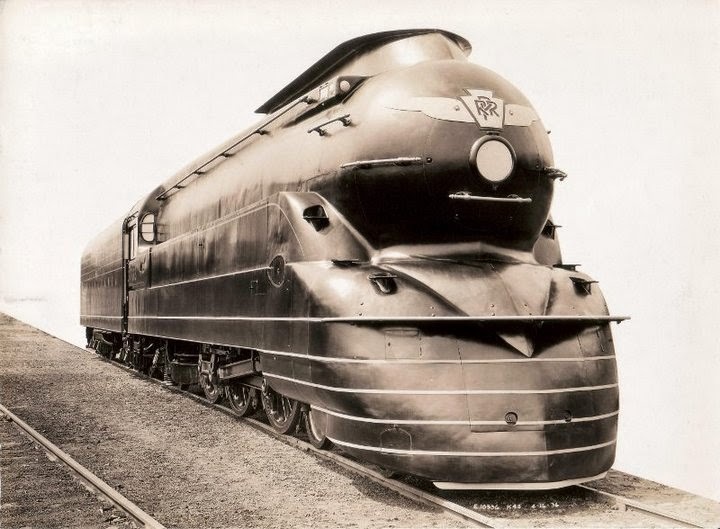 His design was probably the most famous American passenger train of all time. 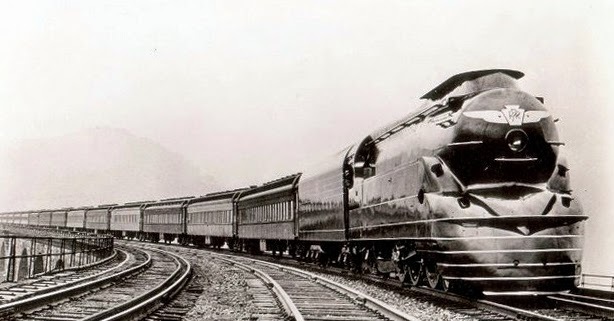 The 20th Century Limited was built for style and stardom (the train conveyed the New York lifestyle) and it tailored perfectly to young executives and “new money.” So popular was the train that the Central often had to run two trains, one in each direction. someone practiced with a jump rope! I got nothing... anyone else wanna caption this? 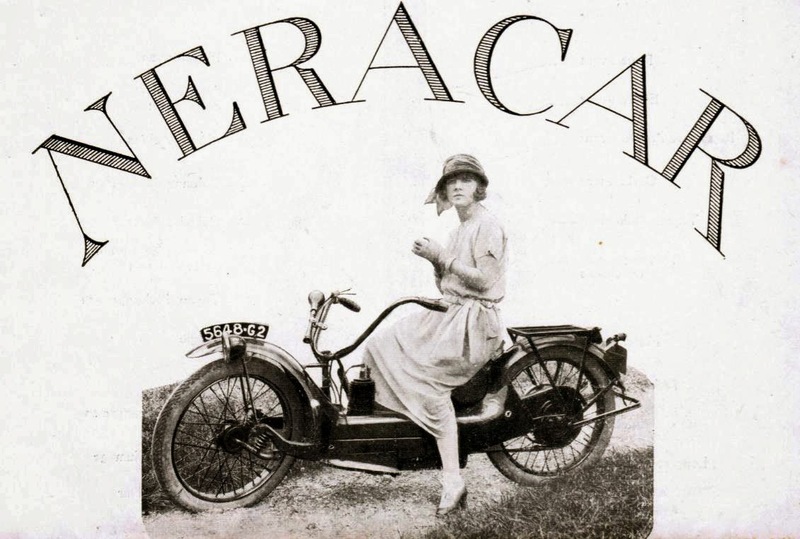 and if you must Segway, do it in style!